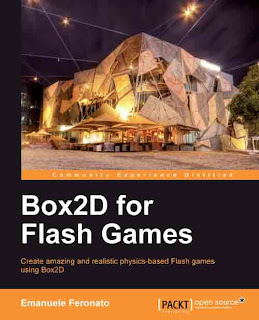 A couple of months ago I got given a copy of the Box2D for Flash Games eBook from Packt publishing to review. I had been very busy over the last couple of months, so had no time to read through the book. However, over the Easter holiday weekend I had some free time to finish the book. Overall, this book is a great introduction to the Box2D physic engine. The eight chapters guide you through the concepts of interaction, forces, collisions, joints, skinning, bullets and sensors. The two popular Box2D games: Angry Birds and Totem Destroyer are used in the chapters to demonstrate the concepts. Each chapter is explained in a clear and detailed way with Actionscript examples to back up each concept. The early chapters get you started with Box2D and as you progress though the book more advanced topics are covered. I would definitely recommend this book to anyone who is interested in learning Box2D. The author has done a great job of covering everything you need to learn about Box2D to create a 2D physic Flash game with real world examples. The author of this book, Emanuele Feronato, has also got a Flash related blog where you regularly post Box2D tutorial, so checkout his blog for more information.